Twenty-two-year-old Sosa had been in-country less than three months and was fortunate to have a wife, Lydia, who habitually wrote letters and sent him food packages. Victor often shared his good fortune with his comrades, so Lydia’s kindness made her a favorite among Victor’s friends. Sosa’s partner, twenty-year-old PFC Richard Anderson of Brooklyn, New York, had been in-country for just over three months. Before the battle began, they were waiting to be relieved by men of the Black Lions’ Alpha Company so they could move to a new position further south on the western perimeter of LZ X-Ray. That move would never happen. While all this was going on, a few choppers circled above us with supplies. They had mail, ammo, food, and other supplies. A few hundred meters from our command group, two Vietcong machine guns lay hidden in the thick brush, taking aim at our men. One machine gun was on the east side and one on the north side of the clearing, according to Ronald Moreno[i], Don Koch, and Fred Hill. [ii] Other VC waited patiently and silently in the brush and in fighting holes that had been prepared the previous day. VC snipers were also sitting high up in trees with a clear line of sight into the clearing. Their preparations were elaborate: the Vietcong had created a web of crisscrossed wires hidden in the thick vegetation covering the jungle floor. 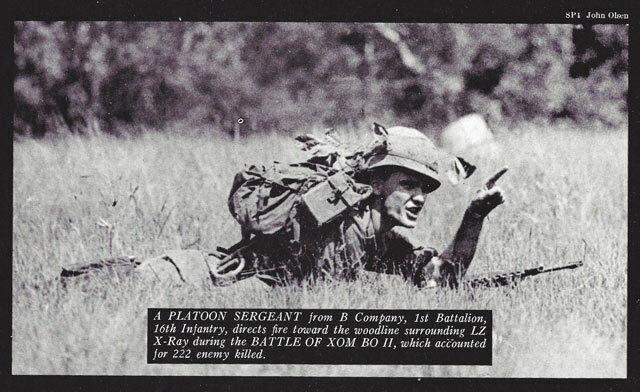 The wires linked their field phones together around the LZ’s perimeter, providing communications between the VC commanders in charge of the ambush. The commanders of the Vietcong regiment knew that the Americans would prep the area with bomb runs and artillery prior to their insertion into the LZ, so the bulk of the VC troops had left the area after it was prepared for the ambush. They had moved a safe distance away from the LZ so they could rest up for the impending battle. A few VC lookouts stayed behind to observe and report any activity happening around the LZ to their commanders. Other VC continued to observe the American units back at LZ Rufe. Around noon of June 17, a steady stream of Vietcong stealthily moved into the jungle surrounding LZ X-Ray. They arrived from a staging area north of the LZ. They were armed with RPGs, AK-47s, recoilless rifles, grenades, claymore mines, carbines, 60 mm mortars, and even .51 caliber machine guns. Still unobserved by us, the VC companies set up their mortar tubes and sent their forward observers closer to our perimeter. As the VC’s 271st units set up, their men waited nervously in their concealed positions. They watched American soldiers eating C-rations, taking a smoke, reading letters, taking a piss, and some even cleaning their weapons. The seconds ticked by and each moment brought the scythe of death a bit closer to the Americans and Vietcong in wait.